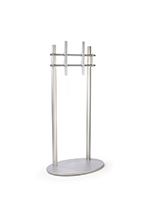 Cheap TV Stands Sized for 60" Flat Panel Plasma and LED TVs Provides the Means for the Display of Vivid Advertising Campaigns! 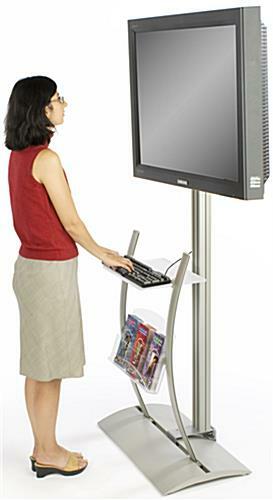 This TV Rack and Your HD TV and Printed Handouts Combine to Create the Best Advertising Station Ever! 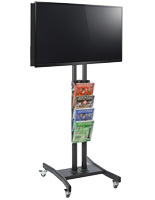 This screen stand is the perfect plasma TV stand for all of your advertising needs, as it fits a range of television sizes. 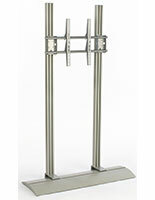 Each unit features a hollow pillar to mount the flat screen monitor. 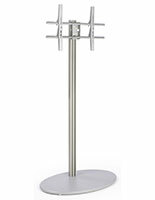 Users can conceal the wires to and from the monitor by placing them through the pillar behind the (4) included plastic strips. 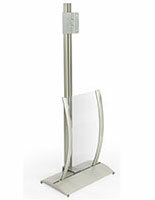 This LCD rach, plasma TV stand has a literature pocket mounted below the television screen. Users can place brochures in this pocket to provide additional information for patrons to take home with them. 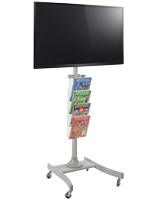 Each unit also includes a display shelf can hold either a DVD player or additional types of promotional materials. 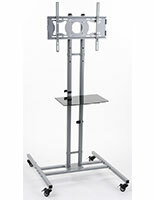 This plasma TV stand, also known as an LCD rack, comes with a VESA bracket for up to 60" TVs, weighing less than 80 lbs. VESA brackets securely mount screens from most manufacturers on this display. Included with the bracket is the hardware necessary to mount most televisions, though some TV's will need other screws that are available at your local hardware store.